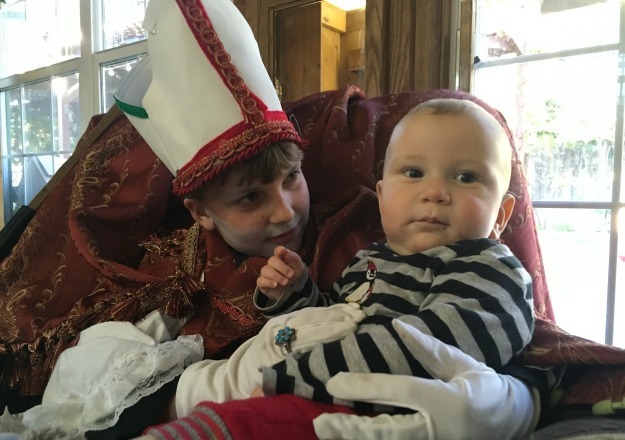 St Nicholas Day holds a place of importance in Catholic homes. This is especially true of homes with little children. After all he is the patron saint of youth. 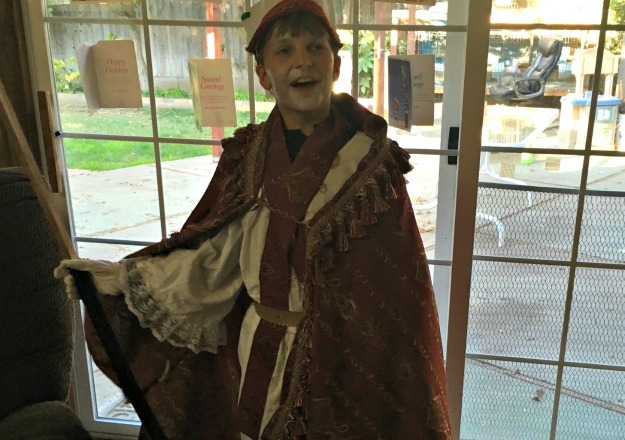 With a visit from this holy patron, emphasizing the sacrificial nature of Advent comes natural. What better way to teach children to prepare their hearts for Jesus' coming at Christmas! The little gifts St. Nicholas leaves also helps spread out the celebration and the gifts that children receive during this holy season. That he is their special patron and is praying for them. That he would like to know what they are doing to prepare their hearts for Christmas. Maybe your children can let him know what sacrifices they are making during Advent either in a letter or in person when he comes to visit. A straw box is a good way for children to count their sacrifices and prepare a soft bed for the baby Jesus to lie on at Christmas. St. Nicholas can help them with ideas for sacrifices-things like right away obedience, sharing, helping with the little ones. Bigger children can be encouraged to offer acts of penance and works of charity. An Advent checklist can be helpful for them. 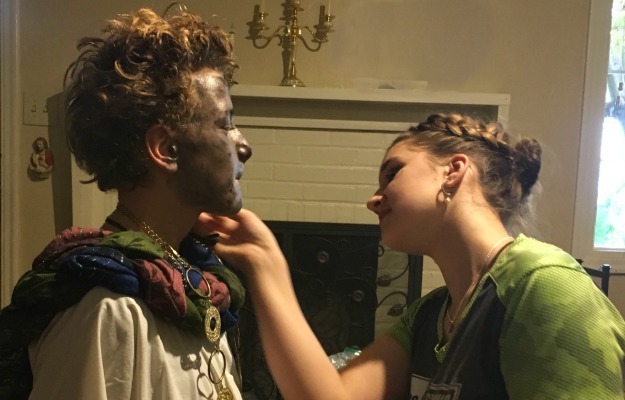 He may even deliver the checklist to older children with their treats. 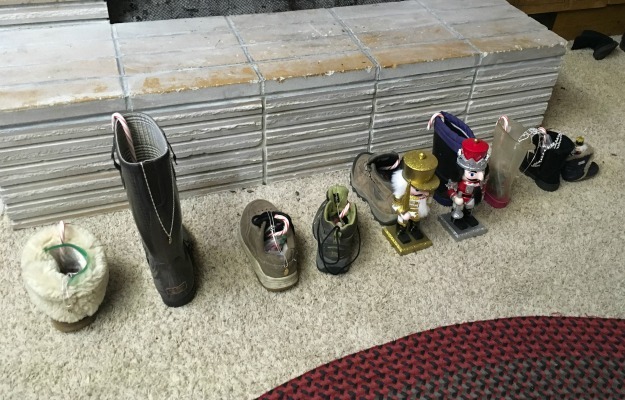 Some families have children leave their boots out on the eve of St Nicholas Day. In the morning they are filled with toys and candy. If no visit is planned a note from St. Nicholas is a good idea. An alternative to this is having a book or movie on hand to share about his life. Children should understand that these goodies received during the early days of Advent are a reward and encouragement for them to keep up the good work. Treat ideas include candy canes, bags of chocolate gold coins, small religious gifts like rosaries or medals and holy cards. Other small gifts that help children be good children like toys that encourage sharing or the type of activities good children should occupy themselves with: coloring, boardgames, and books are all appropriate treats. Fads and commercialized items should be avoided. Remember, these gifts are coming from a holy bishop! A small and intimate way of keeping the tradition of a St. Nicholas visit is to have St. Nicholas come after dinner. 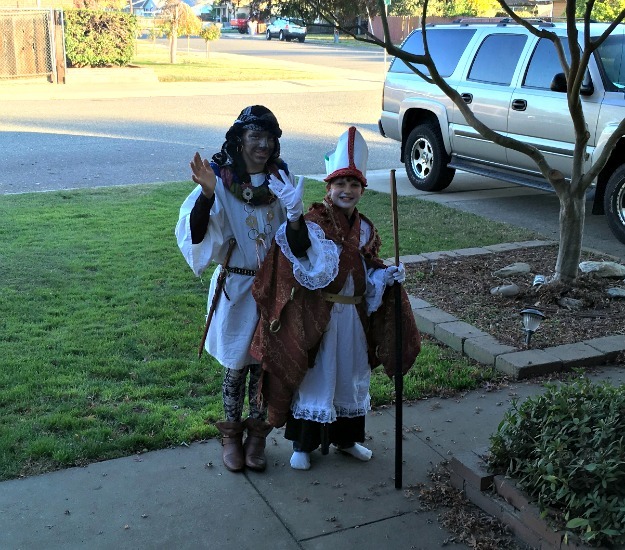 Have a costume left over from All Saints Day on hand for the holy bishop. A darling novel by Hilda Van Stockum paints a lovely picture of what visits from St. Nicholas looked like in Holland nearly a century ago. In one of the most endearing chapters in The Winged Watchman Pieterbass and St. Nicholas make an appearance in the Van Hagen home. The magic of the scene is very inspiring. The holy patron of children always tells children that he has come from heaven, and that he is their special patron who's praying for them. He questions each child about what they are doing to prepare their hearts for Christmas. 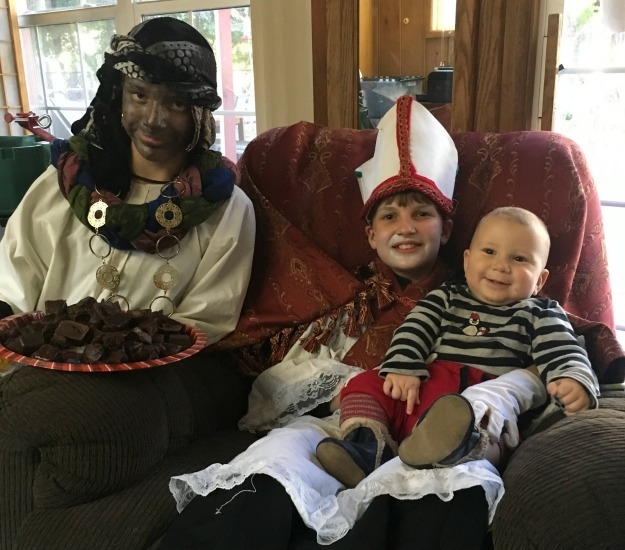 He gives them some chocolate and departs leaving the children with holy thoughts and encouragement to keep up their good works. St. Nicholas always points to the Crib, to Jesus like all real friends of Our Lord and holy shepherds of souls. Remind children that St. Nicholas was a real person and he is a holy saint interceding for them in heaven. He is as real as their guardian angels. Perhaps it is best not to make any parallels between our holy patron and "Santa Claus" for upon closer look they have very few similarities. Santa Claus is not bad but St. Nicholas is much better! Decorating Christmas cookies is so much fun. If no visit is planned, having a cookie exchange or cookie decorating party is a great alternative. Ask the women you invite to bake some sugar cookies or ginger bread cookies. Ask them to bring them to the party undecorated. Provide the icing, frosting and sprinkles. If you'd like to host a craft party, a cookie exchange can be arranged having each family bring cookies to exchange and have a Christmas craft prepared. A story book of St. Nicholas' life or a cartoon about St. Nicholas is a good way to bring this party to a close. What are your favorite St. Nicholas day traditions?